As cute as those mini brioche are they are also quite tedious to make. In addition, with only 12 mini pans I'm left with a whole lot of dough. No problem, though, I used the remaining dough to make one large loaf. This loaf is called - Brioche à tête. The tête (head in English) is the little ball on top. A head is not the first body part I think of when I see this loaf, but maybe that is just me. 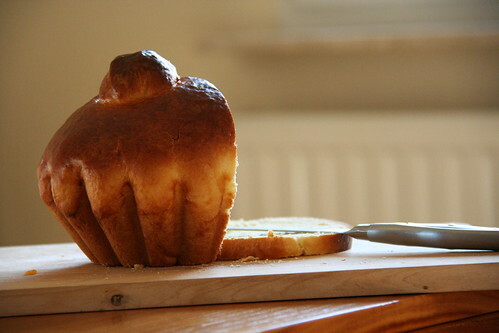 Wow, the brioche looks fantastic! Did you buy a special brioche pan to make it? Cactus? And I know exactly what body part you're talking about, hahaha! Haha!!! Head is not the first thing that came to mind at all!! !